Otherwise known as “Jamie’s Pasta Bake”; a simple, tasty dish that can be easily doubled for parties. Delicious hot for dinner with some garlic toasts and also cold the next day for lunch. The recipe suggests using orecchiette but any pasta shapes will do so it’s a great way to use up all the packets lying around the cupboard. Heat a saucepan on Medium-low heat and a couple of glugs of olive oil, onion, garlic and chill. Slowly fry for 10 minutes until softened but not coloured. Add tinned tomatoes and a small glass of water and bring to a boil. Simmer for 20 minutes. Wizz sauce until smooth add basil leaves, red wine vinegar and season. Boil a large pot of salted water and cook the pasta shapes according to packet instructions. Drain and then toss with half the tomato sauce and a handful of parmesan. 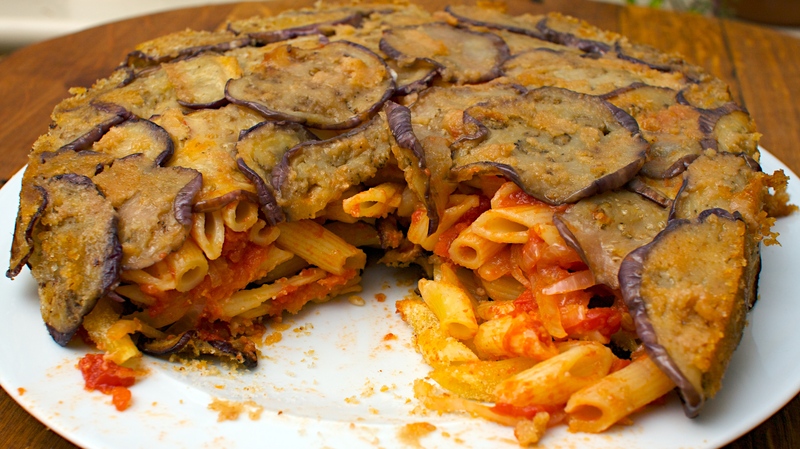 Rub a little olive oil in a baking tray and layer a third of the pasta in the bottom. 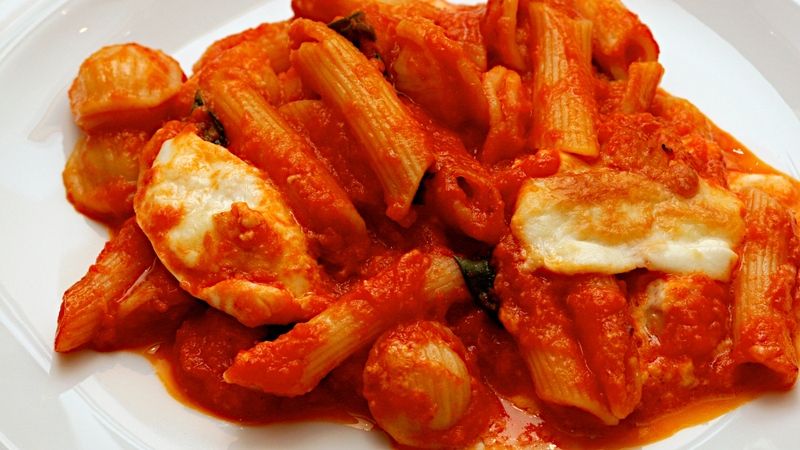 Follow by a layer of tomato sauce a handful of parmesan and 1 mozzarella ball. Repeat two more times and until ingredients are used up. 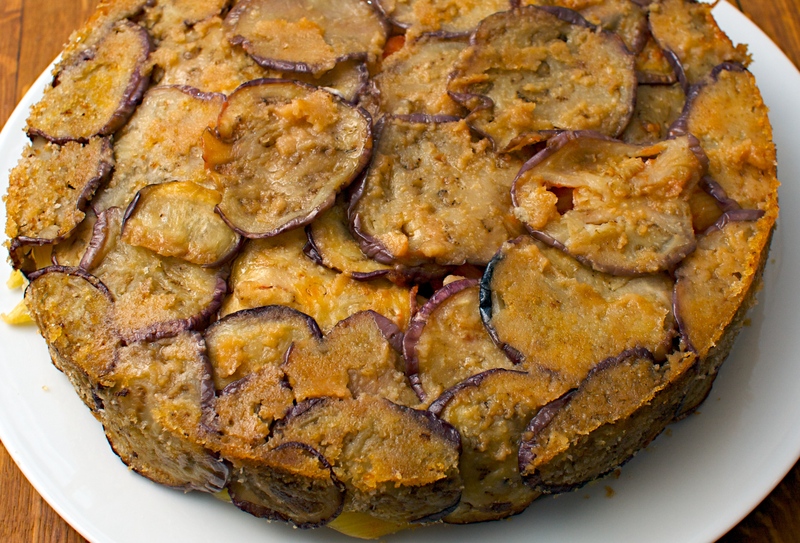 Make sure that there is a good layer of cheese on the top. Cook in oven for 15 minutes or until golden and bubbling. Wine suggestions: This will work equally well with a nutty, dry white like a Verdicchio or Greco di Tufo or a mid-weight red like Barbera, Montepulciano d’Abbruzzo or a fruity Chianti. You don’t need to get too complex as this is a very social dish so it suits a social and easy style of wine. I would like to point out that the plate above is Jono’s and not mine – he’s much greedier than me. If you don’t like Italian food you might want to ignore us for the next while as we’re somewhat smitten. 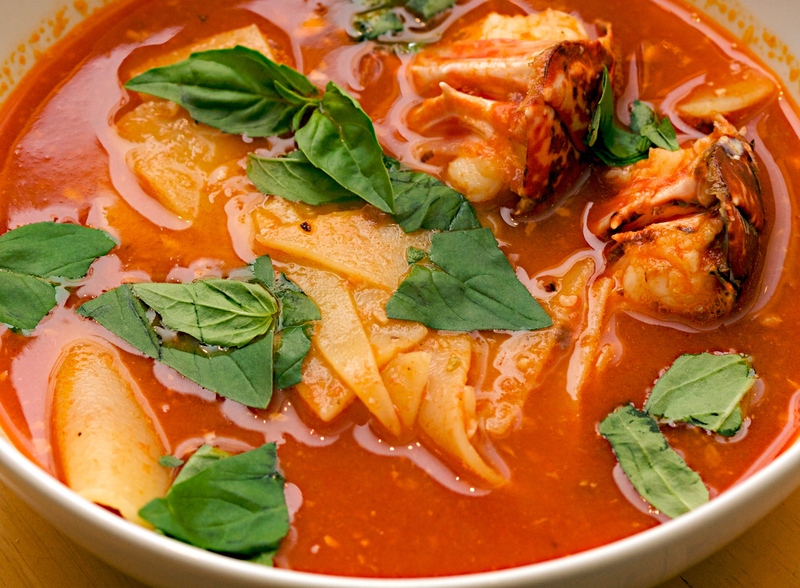 We tasted a few stews in Italy, peppery and otherwise, and they were fantastic. Jono’s had his eye on this recipe for ages too so we got on to Tom O’Connor in Glasthule, our butcher, who rose to the challenge as always. 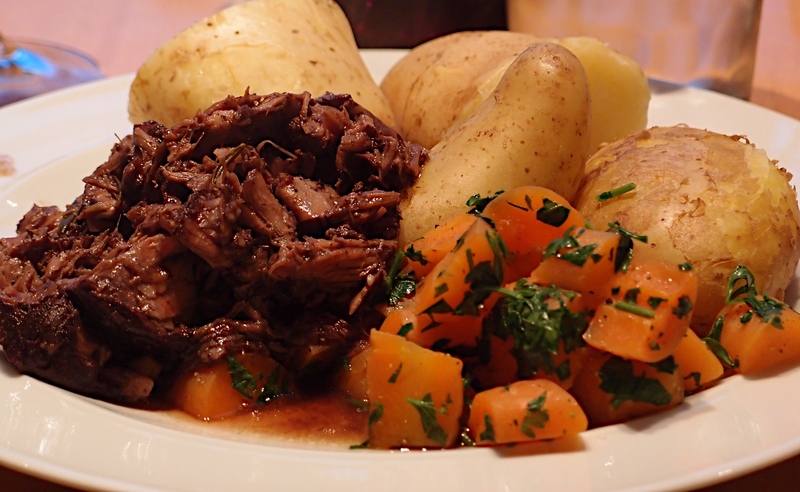 You can use beef or veal shin for this recipe (we used veal). Jamie suggests buying the whole bone, slicing the meat off, and adding the bone to the stew. We got it osso bucco style which worked brilliantly. There is a shocking amount of black pepper and garlic in this recipe. You hardly notice the garlic by the time it’s cooked but the pepper is fierce. Jamie recommends 4 tablespoons of fresh ground black pepper. I think we’ll try two next time which might be safer for a crowd. This is a really easy dish to cook but it takes 6 hours in the oven (or overnight if you like) so be prepared. This gives intense flavour and makes the meat melt – you can literally lift the bones out and carve the meat with a spoon. 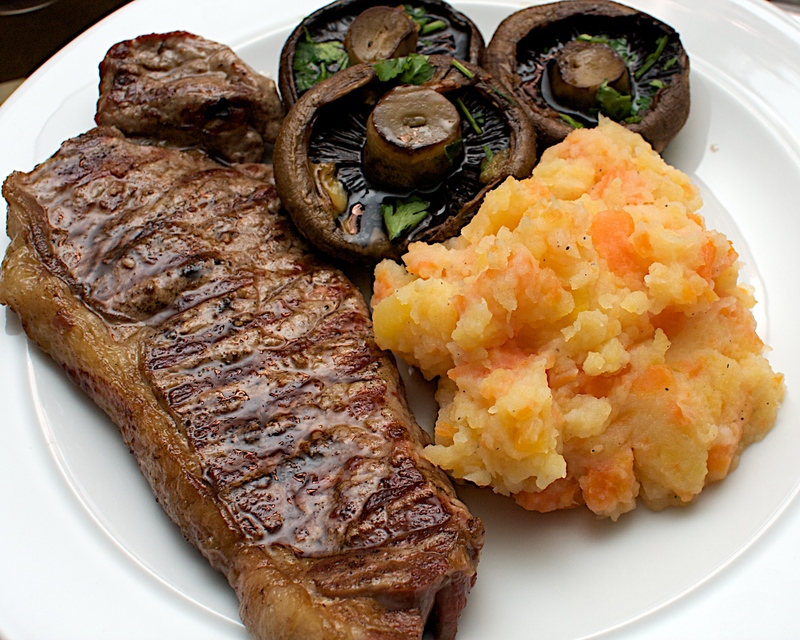 If your meat is in one piece, slice the meat off the bone in big chunky slabs (keep the bone). 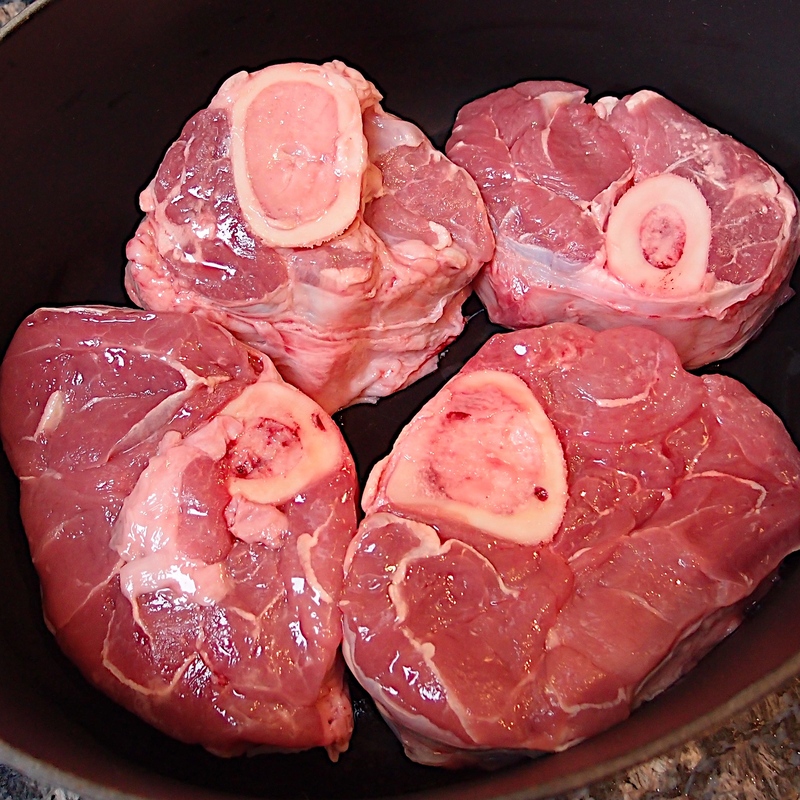 If it is osso bucco style leave it as it is. Put a layer of sliced meat in the bottom of your biggest casserole, cover with some garlic cloves and sprinkle with a tbsp of pepper and a little salt. 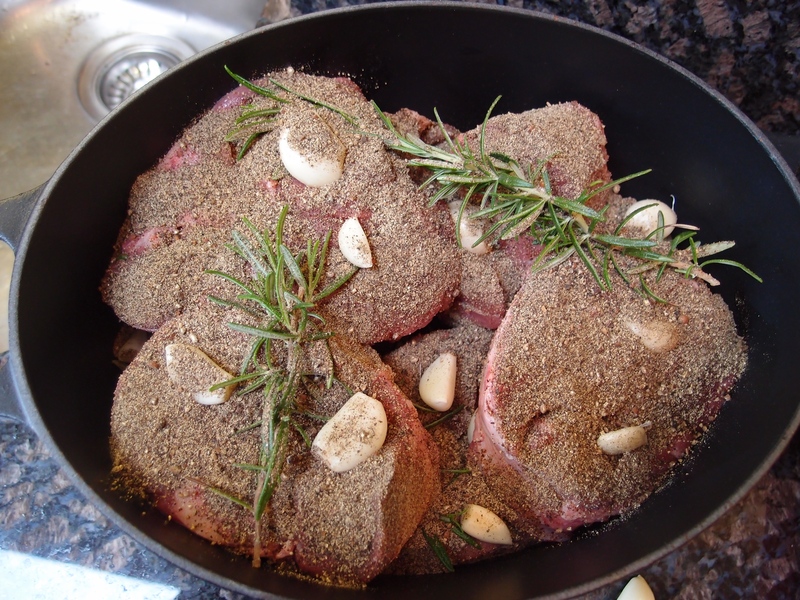 Add 2 sprigs of rosemary and repeat with another layer of meat. Keep going like this until your ingredients are used up and you have a full pot. Pour the wine over the top, add any left over bones and the bay leaves. Top up with water if necessary to cover the meat. Bring to the boil and cover tightly with double thick foil and the lid. Cook in the oven for 6 hours (or overnight at 140C/275F/Gas1). When it’s done, skim off any fat, remove the bones, bay leaves and rosemary twigs. 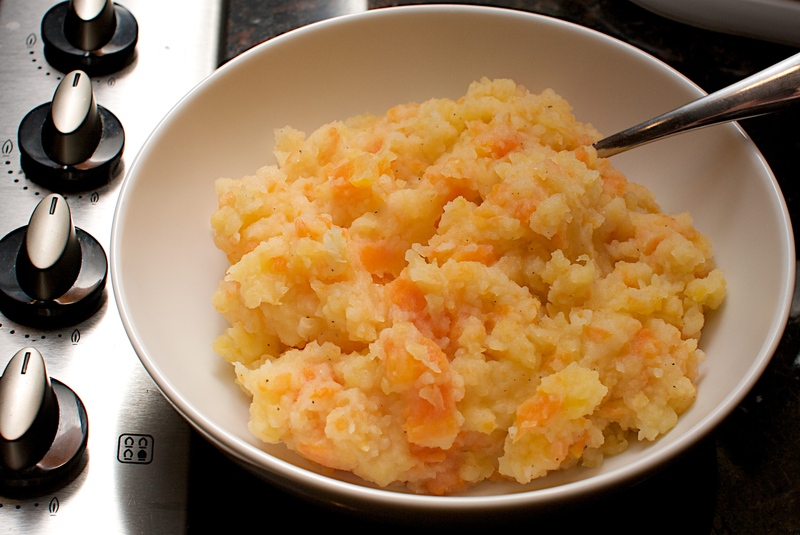 Serve on toast (hunter style) or with some new potatoes and carrots (Jono and Jules’ style). (Original recipe from Jamie’s Italy). 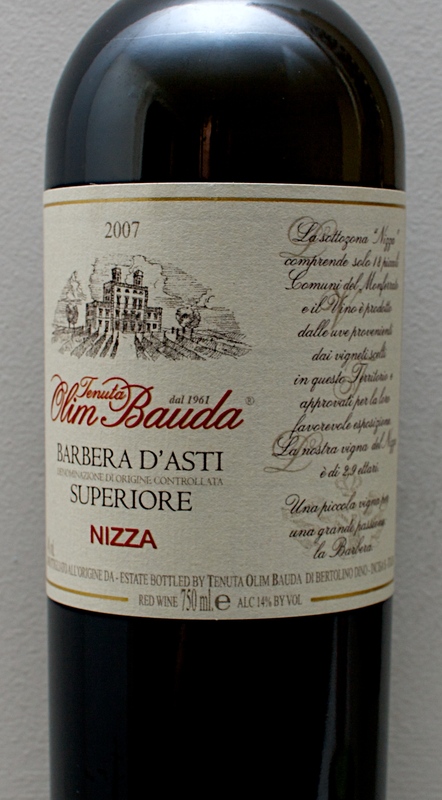 Oops, we’ve broken our price point slightly on this one – the rule for wine of the week is to stay under €15.00, but this was the cheapest Italian red in Fallon & Byrne on Exchequer Street, Dublin and came in at €15.99. As we had a hankering for an Italian at the time to go with our meatballs (see below), this wine gets to be our Wine of the Week! 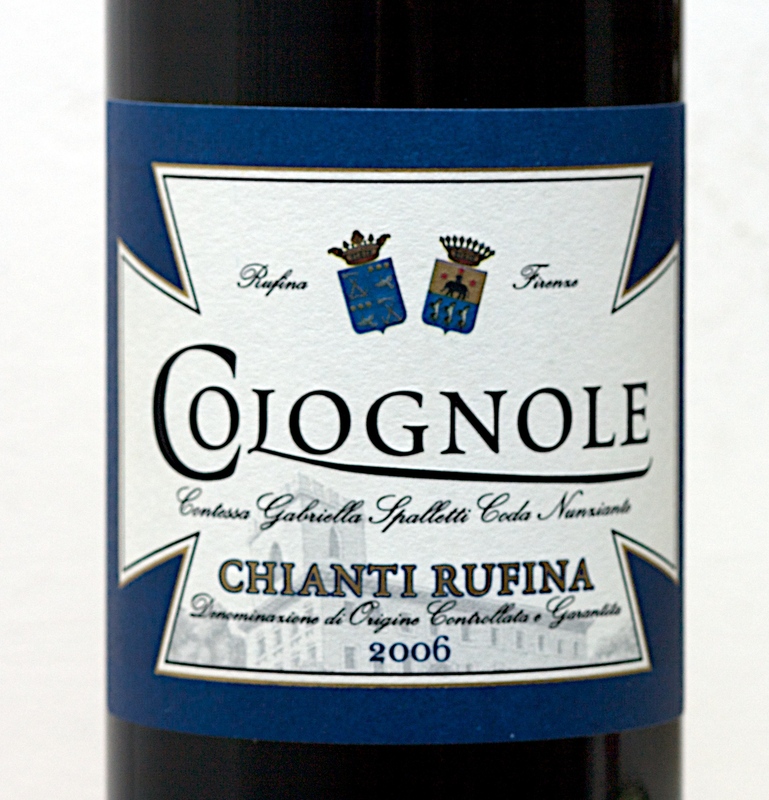 From an area slightly less prestigious than Chianti Classico, this Chianti Rufina delivers on value and flavour. It had a lovely, juicy cherry flavour which was balanced with fine, and slightly rustic tannins. This gave the wine a delightful character and was perfect with the Meatballs. I am sure this would have been a few Euro more if from Chianti Classico as it had personality and good levels of fruit.